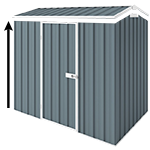 This extra large Regent garden sheds is manufactured from low maintenance ribbed steel sheeting and is designed to add value to your home. Doors are hinged for added security. To secure the walls to your concrete slab you will need 16 anchors for this shed. Good day, is the colour bond sheds available in Dune? Thank you for the question. Our Regent range comes in 5 Colorbond colours, Pale Eucalypt, Cottage Green, Paperbark, Classic Cream and Woodland Grey. Unfortunately it is not manufactured in Dune, sorry. Shed Blanket (3) To help minimising roof condensation in your shed as well as to keep it cool in summer and warm in winter. A great investment if you spend a lot of time in your shed. Timber Flooring Kit (10) to substitute concrete slab. Made from 100% Australian renewable plantation grown timber. Comes with 10 Years Warranty.